Okay!! I am thrilled, thrilled, to show you the cover of my book that is coming out in June. June 19th. A long time from now. 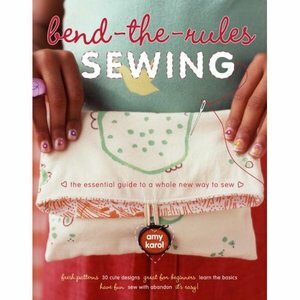 It's called Bend-the-Rules Sewing; the essential guide to a whole new way to sew and It's published by Potter Craft, an imprint of Random House, and should be available all over and on Amazon, right now, as a pre-order. Whoo-hoo! It's got a front section all about learning how to sew and how to have fun while do it and 30 sewing projects geared toward beginners, but I really think seasoned sewers will like it too. There's an assortment of fun projects like napkins, coasters, bags, quilts, curtains, pillows, smocks, bibs, and of course, aprons, and many more projects as well. A little of everything, including stamping and painting on fabric to make it extra cool. My goal was to design projects that were fun, easy, and captured that Japanese craft book aesthetic of playfulness that I love so much. . .and I am so very happy with how it turned out! I was so lucky to work with an amazing team; photographer, art director, stylist, editor, a truly amazing group of people. I could go on and on here. It's actually so hard to write about, it's been such a big part of my life for so long now. I turned in the writing, the directions, the finished projects, and over 200 illustrations last April, but the design of the book was actually started in Fall 2005. It's been there, in my life, for a long time. I have learned so much about the publishing world, taking on a project this big, and trying to balance it all with family and life-it's been amazing ride, and I am so grateful to have had the experience. Okay, I'm not going to say much more about it for a bit now, cause really, you can't even see it until summer, but I sure hope you all like it!! It's irreverent, down to earth, and will hopefully take the mystery out sewing and will make you laugh at the same time. 'Cause laughing is good, right? And thanks family and friends who have heard the saga of all this for the last 18 months. Really, thank you.